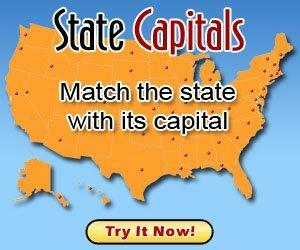 The capital of California is Sacramento and the largest city in California is Los Angeles. Los Angeles is also known as "The City of Angels." The abbreviation for California is CA. Residents of California are known as Californians. "The Golden State" is a nickname often associated with California. California is bordered by Oregon, Nevada, and California. The Pacific Ocean runs along the California coast. The state song is "I Love You, California." The state symbols of California are its state flower, the California poppy, and its state bird, the California Valley Quail. The Redwood is the state tree. California ranks third in population. Though it is well known for movie making, entertainment and the tourism industry, California was once extremely popular because of the mining business. Though it is not so big now, there was once a huge obsession with mining for gold in California. California's state motto is "Eureka," which is Greek for "I have found it." Do you have facts that you'd like to contribute to our California page? If so, please use our contact us form. We will probably need to fact check any contributions so please provide us with a link to a source to verify it. Want to know about preparing for the California Standardized Test Standardized Testing and Reporting or the STAR? Are you interested in information on Homeschooling in California or a California homeschool parent support group? The most recent homeschool statistics from a Federal Government study concluded that about 2.9% of the K-12 students (1.5 million students) were being homeschooled in the United States as of spring 2007.